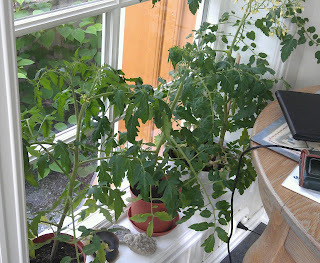 Tomato plants need sunlight, water, love and attention. Small seedlings grow into rich green foliage with flowers that turn into fruit, and with the proper support the plants continue to grow. Sometimes I like to think of stories as such. Each story is a wonderful addition to a garden rich with ideas to share. As a writer it is our job to give our stories the ability to grow and the support that they need to carry the fruit and share the harvest. The Insecure Writers Support Group is also much like this, so this month I would like to give this group some sunlight, water, love and attention. Remember that we are all part of this garden and by sharing and supporting each other; the fruit will only be sweeter. My two sons met each other for the first time yesterday. Two peas in a pod, and my family garden is doing quite well. Tell me how does your garden grow? I feel so tiny! 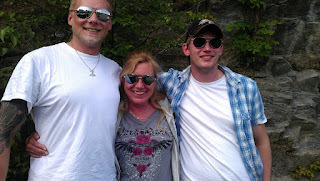 Me and my sons, together for the first time. Have a wonderful 4th of July for those who are celebrating it today! You must be delirious with joy to have your sons back! Good to see you so happy and to be hugging both sons at once! Lovely photo, you must be so happy. I don't get a lot of sun, so I plant my tomatoes in pots in the sunniest spot I can find. Then I hope and pray a big wind doesn't knock them over on top of each other. It usually happens once a summer. Hmmm, I don't think I want to equate that to writing at all! I'm so happy for you. It must be wonderful to have your family together. Siv, some of our happiest memories are with family. You must be ecstatic. Sorry I've been absent. How did the visit go or is he still there? I hope you are having a wonderful time. My boy should be back in about a week. You'll hear me hootin and a hollerin all the way over there. I just bought a house plant! Must have been a wonderful experience to have your sons meet. My garden's hanging in there, but I'm not sure if I can say it's thriving. Interviews with the Gods and more! This website and its content is copyright of - © Been there done that - © Siv Maria 2014. All rights reserved.